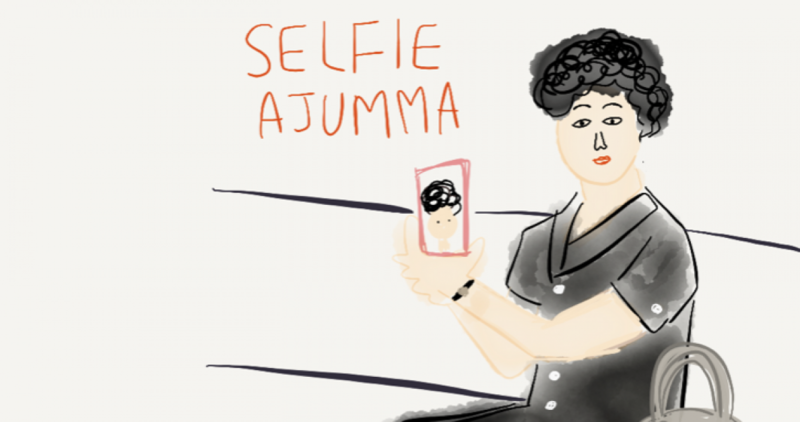 Smartphones are now mundane communication device among ajummas in Korea. They use smartphones not only for communicating, but also for consuming digital products as well. The number of ajumma mobile shoppers are growing and they purchase both tangible and intangible products for example, clothes (tangible) and apps or ebooks (intangible). They were used to be TV home shopping lovers so there were various products aimed specifically at ajumma customers on TV home shopping channels. Ajummas are still important customers for TV home shopping in Korea but these ajummas are not watching TV home shopping channels on the couch any more. They are now shopping at mobile shops through their smartphones without barriers of time and space. Young women (younger than ajummas, I can say their age range is from early-20s to mid-30s) and Moms (early 30s to early 40s, usually they have young children-infants to around 15 years old-these Moms are not to be yet ajummas, it is like pre-ajumma level I can say), they are biggest consumers of mobile shopping but now ajummas become ‘mobile shoppers’. For this reason, many of mobile shopping sites provide specified products that are aimed for ajumma consumers. image from ‘Azmang’ :department store for ajumma (they said) of Mobile Auction.co.kr (http://itempage3.auction.co.kr/DetailView.aspx?itemno=B299375605). image from ‘Madame Sense’ of Mobile Gmarket.co.kr (http://item2.gmarket.co.kr/item/detailview/Item.aspx?goodscode=341536165&pos_class_cd=111111111&pos_class_kind=T&pos_shop_cd=SH&keyword_order=madame+sense&keyword_seqno=8931769789&search_keyword=madame+sense). Like photos I attached above, those mobile shops sell clothes especially for ajumma customers. They actually categorise those clothes as ‘Mom’s clothes, Ajumma clothes etc’. You can tell those clothes are very ajummarous items (according to stereotyped images of ajummas as I mentioned before). This is good development that mobile shops concern ajumma customers and it tells the number of ajumma mobile shoppers are increasing constantly. However, I would like say something about this. Well, I don’t feel happy with some mobile shops that target to especially ajummas. Some of mobile shops sell limited items. I mean those sellers (maybe) have biased views about ajummas’ fashion tastes. When I google mobile shops for ajummas (or middle-aged women) I can find shops like above. I don’t know what I have to say exactly but I feel those mobile shops for ajummas (especially shops for fashion items) are quite different from shops for younger women (or non-ajummas I can say). Whenever I go to Namdaemun market with my mum, there are several fashion malls especially for ajummas and their clothes are really fashionable (good designs, better quality, beautiful combination of colours and textures, trendy etc.). But what do you think about those clothes that I uploaded above? I think mobile shops especially for ajummas are not good enough yet. I’m sure they’re improving continuously but unfortunately there are not various choices for ajummas when they do mobile shopping yet. Ajummas are not smart ajumma, I said. They’re using smartphones in their everyday practices in many ways for various purposes. Mobile shopping is no exception. Ajumma mobile shoppers will be increasing dramatically and I really hope there will be more and better mobile shops for ajummas. Remember, ajumma power is amazing. Posted on 22 Jan 2016 by moon ajummaPosted in Smart Ajumma (English)Tagged ajumma, ajumma fashion, ajumma mobile shoppers, ajummarous, auction.co.kr, gmarket, 아줌마, Korea, Korean fashion, mobile shopping. Previous Previous post: 아줌마들이 스마트아줌마가 된 이유는? Next Next post: 아줌마 모바일 쇼퍼!